For a consumer something is valuable if the benefits exceed the cost. Whether that is a lounge suite, a car or professional advice. The real issue is rarely just cost, no matter how much we hear people debating it or questioning the cost of something. Let’s consider a quick example of pure “advice” where the value is rarely questioned. Consumers routinely pay several thousand dollars to an estate planning specialist for advice on how to keep their assets from prying hands. The cost is explicit, the benefits easily understood by the consumer, and an assessment of “value” is easily calculated. To the consumer they have exchanged $3,000 (say) for advice on how to keep $1,000,000 in assets away from future prying fingers. There is clear value as the benefits obtained from the advice far exceed the cost. In financial services the benefits obtained from the advice are difficult for many advisers to articulate, and therefore explaining the value generated falls into the too-hard-basket. After all, we are usually talking about “probable benefits” which does make it difficult. Probably you will receive this type of result by investing this way. Probably you will receive that type of benefit IF that risk event happens. Probably, probably…. So generally the advisers problem is being able to describe the benefits in a meaningful way to clients. Without a clear understanding of the benefit that will be obtained, the consumer simply cannot accurately assess the value of advice. To answer the value question for consumers, the adviser needs to be able to clearly describe the benefits arising from the advice. With little research available in NZ we need to look overseas to provide some examples. In Australia there has been a series of studies on the value of advice, particularly with a view to trying to quantify the value to a consumer for various financial services. This included services delivered with and without advice. The mere provision of simple tools (e.g. online calculators) costs relatively little to deliver to consumers as we’d expect. Consumers obtaining single issue solutions (e.g. advice on workplace super scheme options) typically paid $250-$1,000 for that advice. Those seeking more comprehensive financial advice (e.g. annual full advice plans) faced fee levels of $1,500 to $20,000 for advice. Handy information, though not specific enough for most consumers, but the wide spread on the numbers reflected different adviser business models. So there is the first part of the problem in valuing professional advice. There is such a range of delivery methods and cost structures that there is no possible way a consumer could compare and then value personalized full advice unless they understand what makes it different to other types of “advice”, and why it is more pertinent to them. Without that explanation an adviser is firstly competing against a Google search and consumers can only compare costs. The second element is being able to explain the benefits that will be derived from the advice. A graphic example came from some different Australian research. It found that the preparation cost for a typical planner preparing & presenting comprehensive advice was just over $3,000 to deliver. Unfortunately the clients placed a value of only about $300 on it. A massive difference between actual cost of delivery and its perceived immediate value. Why? Because the clients couldn’t see the benefits. Consider the areas that were perceived to be valuable to consumers. There were the expected contenders such as budgeting, tax management issues, debt re-structuring, cash flow management, maximizing government benefits, life insurance and so on that presented value to some degree. There were some slightly different perceived benefits as well though, such as better lifestyle, goal setting, financial education and negotiating improved benefits and/or fees that were deemed valuable. Advisers do all these things so there is little doubt that advice DOES create value at some level. There is a good story there, but how to place particular value on it that can be measured easily by the consumer? 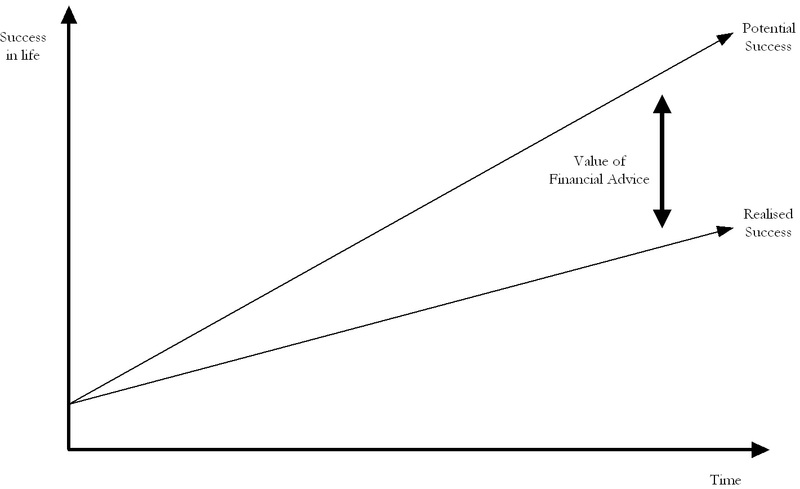 Consulting actuaries attempted to quantify the value of the advice, in present value terms but over the life of the estimated advice/benefits period. It indicated that advice given to a younger family during the wealth creation phase resulted in over $320,000 additional value during the course of their financial planning life. The cost of the advice attributed to this same family over the same period was about $40,000. There were a number of tested scenario’s – one with much more impressive numbers (over $600,000 added value), and some with less impressive numbers. All uniformly compared the cost of the advice component with the additional benefits received by the consumer from that advice though. The conclusion was resounding in all scenarios. 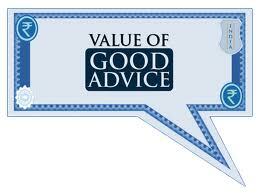 Advice added value above and beyond the costs of obtaining that advice. There were additional intangible benefits that couldn’t be quantified in dollar terms that shouldn’t be ignored either. Some 66% of consumers cited “peace of mind” as a benefit; 63% felt they had “greater control of finances”; 62% felt they had “the prospect of a more comfortable retirement”. These are “value” too. Undoubtedly the case can be made that good professional advice provides benefits that are well in excess of the cost. It is valuable therefore. The secret to valuing the advice component is in addressing two issues clearly – and as early as possible. The first hurdle for advisers is to be able to explain why their structure and method of delivering advice is superior to other choices for the consumer, particularly the low/no cost choices. Then the benefits for the consumer have to be articulated, and preferably quantified wherever possible. It would seem that experienced advisers would have the very real advantage of being able to draw upon their real life examples and provide case studies showing the work they have done for clients in the past, and showing the costs charged and the benefits obtained (testimonials in this respect are gold!). Like the estate planning specialist in the earlier example, the cost of good advice compared to the benefits it can produce for consumers should leave no doubt that it is valuable. © 2011 Tony Vidler. All rights reserved. All materials contained on this web site not otherwise subject to copyright of other parties are subject to the ownership rights of Tony Vidler. Tony Vidler authorises you to make a single copy of the content herein for your own personal, non-commercial, use while visiting the site. You agree that any copy made must include the Tony Vidler copyright notice in full. No other permission is granted to you to print, copy, reproduce, distribute, transmit, upload, download, store, display in public, alter, or modify the content contained on this web site.